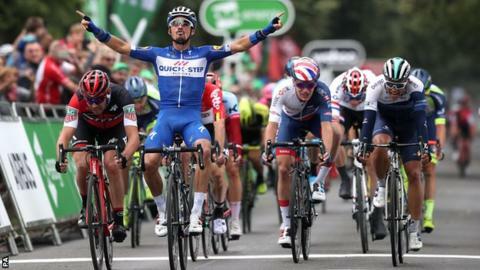 France's Julian Alaphilippe won the third stage of the Tour of Britain, while New Zealand's Patrick Bevin came second to move into the overall lead. Alaphilippe, racing for the Quick-Step team, gained the victory in a sprint finish to move up to third overall. The third stage was held in Bristol with the next stage taking place on Wednesday over a distance of 183.5km from Nuneaton to Leamington Spa. The race is held over eight stages with it ending in central London on Sunday. "I'm really really happy - like always when we win - but especially today because we tried since start of the race and today we knew it was a good opportunity," said Alaphilippe. "The team did a great job all day, they controlled the race - especially the finale With Bob [Jungels] we were together trying to attack or maybe sprint with me and in the end he did a perfect lead-out. "I was also really happy to finish the job of my team with a nice victory." Britons Ethan Hayter and Connor Swift came fourth and sixth respectively in Bristol, while Hugh Carthy and Scott Davies are ninth and 10th respectively in the general classification.